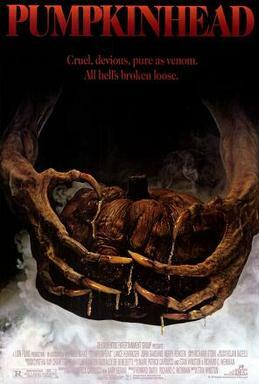 Stan Winston’s 1988 feature, Pumpkinhead. It’s polarizing, undeniably original, yet somehow unfulfilling. Either way, it’s worth a look. There’s a prologue featuring a family out in a cabin in the woods (always good) and something scary lurking therein. Fast forward and the boy who saw something untoward is all grown up (Lance Henriksen portrays Ed Harley), with a son of his own and running a general store. Who should happen by? A bunch of college kids on a dirt bike vacation. When out acting crazily and impulsively, a tragedy occurs. And it’s the fault of those no-good kids. As a result, dad has to exact revenge, which he does by proxy – by way of the eponymous creature. 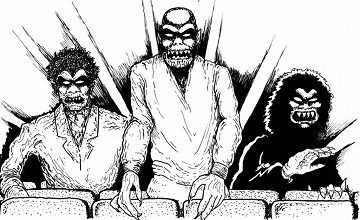 Join us as we discuss Pumpkinhead!